Our latest Chefspective interview offers the opinions of a chef with a view: Katarina Todosijevic, Head Chef at the National Portrait Gallery's Portrait restaurant. With a world class collection of art below her top floor eatery featuring stunning views of many of London's most noted landmarks, Kat shares her secrets to making a menu that's equally inspiring. How long have you been with Portrait? What were you doing before and what inspired you to become a chef in the first place? I have held the position of Head Chef at the Portrait Restaurant for the past five years and worked with Searcys for a total of ten. My first role with Searcys was at the Waterstone's bookstore in Piccadilly and then I had the privilege of opening 1802 in Docklands. Before this I worked for the Conran Group, where much of my time was spent at the Butler's Wharf Chop House. My mother and grandmother were my inspiration for becoming a chef. Food and entertaining were very much a part of my upbringing and childhood. You're originally from Sweden. How long have you been in the UK? Have you cooked professionally in other countries? I have been in the UK (or should I say London) for twelve years. However I started my career in Sweden working in a number of restaurants, most notably the highly respected Grythyhans Gastigivere gara, owned by Carl Jan Granquist. I have also had the pleasure of working in Thailand where I had the opportunity to work for a week as a “guest” and would consider opportunities abroad again in countries such as Spain, Italy or France. Restaurants that are well known for stunning views as well as those placed within museums and other cultural institutions and tourist attractions often have a reputation for being overpriced or for making quality and taste a secondary concern. On the contrary, we found, in addition to a gorgeous view in a fab setting, that our lunch at Portrait was good value and delicious. How you do overcome such “go for the view” preconceptions? Do you find many patrons coming simply to dine at the restaurant regardless of what may be on in the Gallery? and I am pleased to see that you felt that we are competitive for what we offer. Our philosophy is to offer “value for money” and I believe that we do this. The view is of course part of the pulling power for the Portrait Restaurant but once you have your guests at their table, it is the quality of the food and service that needs to do the talking - not just the view!! Time and again the same guests return to the restaurant, and we have a huge number of guests that dine with us on a regular basis. We know these guests by their names, what they like, which tables they prefer and no matter if they just walk-in without a reservation, we will always find them a table - these guests are our bread and butter. We have also noticed a significant increase of return guests that have been with us once... clearly we are getting something right!! How important is the look of a dish in a restaurant located within such a venerated visual arts venue? Do you find the demands and expectations are different than those at a standalone restaurant? I don’t think it matters where the restaurant is located. For me the taste of the dish will always be the most important element however with everything in life presentation is also very important as this is what your eyes see first and many guests will determine if they will like their dish before they have even sunk their knife and fork into it. If you manage to combine both, then you have a winning dish. What goes into coming up with a seasonal menu? How do you balance your own personal tastes with what you think your patrons will enjoy? All the menus are seasonal hence we can change them on a daily basis. 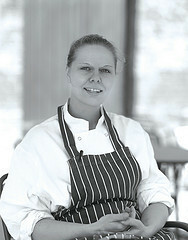 I work closely with my chefs in the kitchen, and we experiment and try different dishes and combinations. Like any menu, you get ideas when travelling or picking up ideas from the industry. Any favourite restaurants or food shops in London that you'd like to recommend to our readers? There are so many good restaurants in London that you are really spoilt for choice. I had a really nice meal at the Royal Oak, Maidenhead, Berkshire. I also enjoy going to Corrigan’s restaurants most notably Bentley’s and Corrigan’s Mayfair. Portrait Restaurant is located at the National Portrait Gallery, St. Martin's Place (WC2H OHE). Visit the restaurant's website for more details.